In view of certain recent statements, One Laptop Per Child Association, Inc (“OLPC”) would like to clarify that Mr. Satish Jha has not been affiliated with OLPC since August 31, 2012. Mr. Jha does not represent OLPC or any of its affiliated entities and the views expressed by Mr. Jha do not represent the views of OLPC or any of its affiliates. OLPC has always encouraged projects expanding the learning opportunities of children in the developing world including the Aakash initiative in India. OLPC is dedicated to providing the world’s children with access to an innovative education. OLPC supports all efforts dedicated to this end and it encourages the makers of the Aakash initiative to continue to explore such educational initiatives. Moreover, OLPC applauds the efforts of the Government of India as it continues to examine new and innovative ways to educate the children of India. OLPC was created to design, manufacture and distribute educational laptop computers to children around the world. Inquiries related to any existing or future OLPC projects should be directed to OLPC, which is based in Miami, Florida. Evan Szablowski was in Addis Ababa, spending a week meeting Ethiopian entrepreneurs. 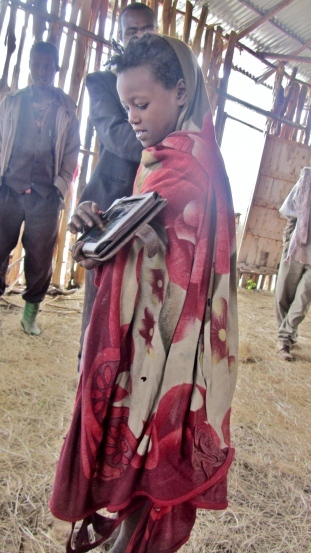 Michael, one of the tech leads for our literacy project in Ethiopia, was one of the people he met with. He was captivated by the literacy project, and on hearing that Michael was heading to Wonchi (one of the two villages taking part in it), he and his teammates decided to tag along. While he was there he met some of the students eager to show off how they liked to use the tablets (they are using Motorola Xoom tablets with mainly off-the-shelf Android literacy apps, with a few custom apps and tweaks by OLPC). At some point, one of the children (below) stood up to quiz the others on what they were learning. Evan wrote up the experience in a beautiful essay on his new blog, illustrated with photos from the day. While this is just one anecdote from the project, the photo series is priceless, and puts the whole effort in context: the geography of the town, the social setup of the small farming community, and the economic circles of the village and the technicians supporting them. An overwhelming sense of excitement and optimism overtook us, and we couldn’t stop smiling as we watched. We left with such a feeling of inspiration and optimism, amazed at witnessing two completely different worlds [fuse] with one another… Zach said this was the best thing he has done in a long time, and I agreed. I hope they realize it someday. I hope that someday one of those kids will say, ‘When I was only 4 years old, the laptop project from MIT came to my village, and it forever changed my future.’ What an amazing perspective that person will have. This was not foreign aid, or handouts… This was education, and just the first step in enabling them. Enabling the young minds of Africa for brighter futures. For a brighter nation, and a brighter continent. @Evan: Thank you for sharing the day with us! Seema Singh recaps some of the history of the Aakash and related efforts for Forbes India. The Aakash got its start with a tender for 10K units from IIT Jodhpur, which was expanded to an order for 100K from the Indian government. DataWind, the company that secured the initial tender, ran a pilot which received much fanfare, but distributed only 572 tablets to 19 colleges. There was some debate as to whether these met the initial spec; and work was refocused on an updated design, the Aakash 2. It’s unclear whether the rest of the inital 10K tablets were distributed to the government; 30K of that model were sold online marketed as the UbiSlate. The Aakash 2 is currently being tested by DataWind and two institutions in India, with hopes for a [new] school pilot of 100K students this fall. The first of those machines are being deployed this month. DataWind has had trouble meeting deadlines and demand. They were beset by many external pressures: heavy pressure to keep the price down, the scrutiny of a very public launch, and requirements that much of their supply chain and manufacturing be based in India (which limited the number of possible partners and added a few single points of failure). They have accumulated many non-binding statements of interest in v.2 of the tablet; but it’s not clear how many will convert now to sales. And after a half-year of heady press they have suffered a half-year of negative backlash. They now aim to offer the commercial version of the Aakash 2 for just under $65; and the Indian government still plans to subsidize half the cost of a model for students – at least for the 100K in this year’s pilot. While this is still an impressive undertaking, as it was when announced last year, the delay has hurt the national story. Now people like Singh are calling the project a disaster rather than a landmark success, and worrying that China will launch a similar program first. She notes that some of the Tamil Nadu vendors are finding it difficult to complete their deliveries under budget. But neglects to note that the program was successful enough for Uttar Pradesh to copy it, recently putting out a tender for roughly 250K tablets (for students passing their 10th grade exams) and 200K laptops (for those passing their 12th grade exams), as year 1 of a multi-year program. We will see whether DataWind manages to make good on their goal of millions of sales this year. Kapil Sibal continues to push for all 220M students in India to have their own laptop or tablet. And he continues to say compelling things of his vision, such as “It will be a device that creates content.” One way or another, I hope that vision is realized. Can tablets make a difference to a child learning to read for the first time, without a teacher or traditional classroom structure? That’s the question we are exploring with our reading project, currently underway in Ethiopia. 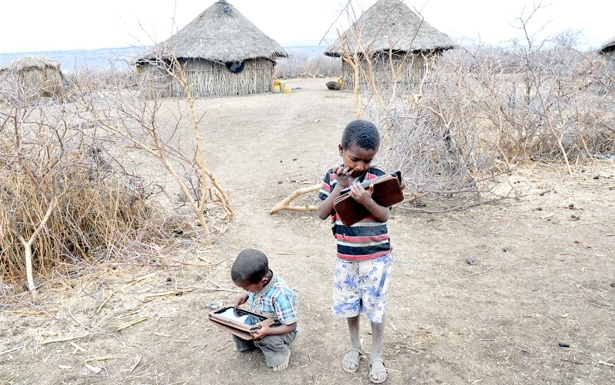 A few dozen children in two rural villages have been given tablets which they are using for a few months. They are interested in learning to read English, and understand this is something they can learn with the tablets; which also come with hundreds of children’s apps. They are equipped with software that logs all interactions, building up a clear picture of how each tablet is being used. Data from the tablets is gathered each week and sent back to the research team, which also rolls out new updates to the tablets week by week. Richard is in Ethiopia this week, to get better first-hand knowledge of how the tablets and other infrastructure are holding up, and a visual sense of how they are being used.